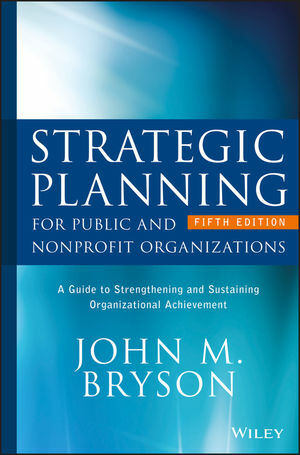 Strategic Planning for Public and Nonprofit Organizations is the comprehensive, practical guide to building and sustaining a more effective organization. Solid strategy is now more important than ever, and this book provides a clear framework for designing and implementing an effective and efficient planning process. From identifying stakeholders and clarifying a shared vision, to implementing plans and revising strategies, the discussion covers all aspects of the process to help you keep your organization united and on track into the future. The field's leading authority shares insight, advice, helpful tools, and specific techniques, alongside a widely used and well-regarded approach to real-world planning. This new fifth edition includes new case studies and examples along with up-to-date resources and references, and new multimedia-related content. Innovation and creativity produce great ideas, but these ideas must be collected and organized into an actionable plan supported by a coalition of support to make your organization great. This book provides expert guidance and perspective to help you bring everything together into a workable organizational strategy. Public and nonprofit leaders are forever striving to do more with less, and great strategic planning can help you build efficiency and effectiveness into your organization's everyday operations. Strategic Planning for Public and Nonprofit Organizations provides the framework and tools you need to start planning for tomorrow today. JOHN M. BRYSON is McKnight Presidential Professor of Planning and Public Affairs in the Hubert H. Humphrey School of Public Affairs, University of Minnesota, Twin Cities.